Wow! It's a great show, with two very energized guests! We covered the goals of their program, Dr. Marfori's vision for the future of a Mobile Integrated Health Care System, and more. We even had a chance to speak with Hillary about the education she got, which qualified her for her role in the program. 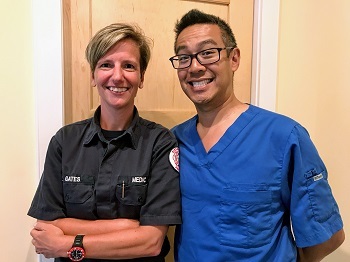 These are two people who are passionate about this amazing leap forward in the role of EMS professionals. The talk ran longer than our typical show, so be ready for a detail packed 55-minute program. If you're listening to this on a Podcast software, it's OK, because if you stop at any time, it will remember where you left off.